• tools - go over your entire bike with the stock tool kit and add to it anything you need - ie. small Vise Grips, etc. • Dumontech or TriFlow chain lubricant. Don't know if it really makes a difference with O or X ring chains but it can't hurt and my bike thinks I'm being 'nice' to it. • 12 foot tow rope - Learn how to tow a bike before you employ this 'last resort' effort. • Small (500ml) fuel bottle full of 20-50 motor oil. All 4-stroke motors are designed to burn a small amount of oil plus, ever had a countershaft seal start leaking in the middle of nowhere? Most of the above stuff (with the exception of the pump, tires irons, lubricants and vise grips) is easily fitted into 2 quart oil bottles that have the tops cut off right where they begin to taper to the pouring spout. One bottle 'nests' into the other one. This will keep your tools from rubbing or wearing holes in your kit, provides you with a container to transfer fuel from one machine to another and makes it real easy to extract the kit from inside the bag. My tire irons are slipped into a bicycle inner tube that is zip-tied closed on one end. Also to prevent the metal rubbing it's way through the saddle bag and to give me some extra rubber to slice into any thing we might need - gaskets, mini 'bungies', rubber bands, etc. • spare clutch cable zip tied to your existing - in case of failure, the replacement is sitting there ready to install or in my case, a small amount of mineral oil for the hydraulic Brembo unit. • rubber gloves - for working on your machine and they also are very helpful keeping your hands warmer worn under regular moto gloves. Dishwashing gloves DO NOT work unless they're way too big for your hands. Even then, they cut the circulation - on my hands anyway. • MSR 'elephant ears' hand guard shields - try-em out. You don't need heated grips and in a driving rain, they keep you hands very dry. When not in use, they lay flat in my small day pack. • The North Face™ down mummy sleeping bag. I've been rained on, snowed on and had that icy north wind ripping across the mountain tops at camp and a bag rated to 0 degrees can be a real solace after a long hard day of riding. When it's hot, I just lay on top of it like a feather bed. (You will NOT be able to stuff a big, synthetic sleeping bag into this saddlebag but you can get a lightweight, summer synthetic bag to squeeze in). • Gaz (brand) butane collapsable cook stove and a 4-cup Cup - I'm liking the Jetboil though and have used one which also fits nicely into the saddlebag. • The North Face™ solo, one man tent. 2.5 pound single wall unit. Pretty small but I'm not hanging out in it and it's better than a bivouac sack IMHO. • a couple decent quality trash bags. I put my helmet and boots in a bag and leave them outside the tent for a little more room inside and to prevent any vermin from moving into or chewing on my stinky gear. Also, it you are going to be riding for days on end through torrential rain (that isn't very fun IMHO) you can stuff your sleeping bag into the plastic bags as you fit into the saddlebag. • I actually like the mountain house freeze dried food offerings (with the exception of ANY of the mexican 'flavored' meals, I don't like burping the seasoning all night). Since the freeze-dried stuff is kind of bulky yet very light weight, I put it in my day pack. • Snacks - energy bars, etc. • You will need to find fuel almost every day and I've grabbed a can of chili to fire cook and make burritos. Most of the little towns we visit (now more than ever) really need our support. Buying stuff, even as simple as candy is greatly appreciated and will hopefully help keep them in the gasoline business. We've already lost Wagontire and even Plush, OR was not pumping fuel for a period of time so we try to spend a little extra (OK, we always buy some beer at our last stop before camp or if it's gonna be another 75 miles to camp, a bottle of tequila or something like that). The key to this system is thoughtful packing. There are probably several tricks we haven't thought of yet but I start by pulling my sleeping bag through the saddlebag so that half of it is hanging out one side and the same on the opposite side. Next, I load the stove, oil, tube(s), tire irons on one side down low (where it should be!). My Sleeping pad is kind heavy so it goes down low on the opposite side. Follow with clothing, socks, hat, etc.. Stuff your sleeping bag starting with the center of the saddlebag (center of rear fender). You will see that a down bag will compress quite small and will leave you with space to slip your tool kit in last. If you need to make repairs in the field, you'll be glad that it's easily accessible. Snug down the compression straps to hold your tent, rain gear on the back behind your seat and the 2 one either side to hold your load right where you want it. NOTE - we intentionally left the straps a bit long. They can be trimmed to your tastes but no matter what - DO NOT LEAVE THEM FLAPPING AROUND LOOSE! When the bike is being ridden on a day loop from camp, simply stuff the extra length inside the bag and zip it closed. If you have a tank bag, there's just that much more space to stash things like your camera, maps, etc.. We have a prototype bag that will be in production soon! If it doesn't fit into this kit, you probably don't need it. We approach this whole concept as a moto inspired adventure that allows the bike to perform as close to optimum as possible and take us to out-of-the-way hot springs, mountain tops, desert mesas, alpine glades - the places you would never drive your truck to camp. Ever ridden over a ridge and said to yourself, "I'd really like to see the sun come here"? This is the answer to that question - YES! Many of you may know my friend, creative partner and office mate, Carlos Perez of Perez design. Carlos and I spend almost as much time together - working a few feet apart - as we do with our own families. He and his wife Laurie and their kids Max and Ana are like family to me, Michelle and our kids, who are nearly the same ages. They're simply great people. On Friday, a terrible accident left Carlos's son Max badly burned. But thanks to Carlos's heroic, speedy and correct reactions (pulling Max to the ground to extinguish the flames, etc.) Max is recovering remarkably well now at the Oregon Burn Center at Legacy Emmanuel Hospital in Portland. Carlos has put up a blog to post updates about Max - and for people to leave messages for Max and the Perez family (click here and scroll down to the comments). If you know Carlos and his family, please post your words of encouragement for brave Max and his family. The Senate is set to vote on a bill (SB 3213) that would permanently protect thousands of acres of wilderness including the Oregon Badlands and Spring Basin which ONDA has worked for so many years to protect. The Senate is set to vote on this major package of public lands bills in the next couple weeks. We need your help to make sure that Oregon’s Congressional delegation does everything they can to get this bill passed. Spring Basin and Badlands Wilderness - protects wildlife habitat, high desert wildflowers and ancient juniper trees near Bend and along the John Day River. Lewis and Clark Mount Hood Wilderness Act - protects wildlife habitat, carbon sequestering forests and clean drinking water in the Gorge and on the slopes of Mount Hood. Copper-Salmon Wilderness - protects one of the last intact watersheds on the southern Oregon coast that is home to healthy runs of wild winter steelhead, fall Chinook, coho salmon and sea-run cutthroat trout. Soda Mountain Wilderness - protects one of the most important wildlife corridors in Oregon, linking the Cascades and the Klamath Mountains. Call Senator's Smith (503-326-3386) and Wyden (503-326-7525) and let them know you strongly support the public lands package (Senate bill 3213) and urge them to ensure Oregon's natural areas are protected this year. Join 3EStrategies and Climate Solutions Saturday, September 27 for one of the largest grassroots days of action in our nation's history!! Oregon is ready to kick-start our clean energy economy! We're READY to build an inclusive green economy and we expect our state's elected officials to lead the way! Click here to let us know you'll be there to help send a powerful message. This event will take place at the E2 Powered solar factory in Bend. E2 was recently contracted to install solar panels on the Redmond airport and has an exciting project with a new elementary school. At the event, Bend Mayor Abernethy will share how Bend is positioning itself in the sustainability arena. Cylvia Hayes, of 3EStrategies, is coordinating development of clean tech jobs for the State of Oregon and will discuss the upcoming green collar job opportunities throughout Oregon. Joelle Robinson, Climate Solutions, will outline policies needed to move our green economy to the next level. Kelli and Mike Hewitt, E2 Powered owners, will speak about real green jobs and the bredth of their impact on the local economy. After the speakers, local community members will put on green hard hats to create a visual display of their message: "We're Ready For Green Jobs Now!" They will then be given a tour of the E2 Powered factory and showroom. Event organizers will collect petition signatures urging elected officials to champion strong climate solutions and investments in green jobs training programs. This petition will be delivered to Oregon state and congressional leaders. Our state legislators and members of Congress will be able to see for themselves that their constituents are demanding bold action ! Click here to let us know you'll be there. Show your support and see where Oregon is headed on Saturday September 27! Mon., Sept. 29: Saviah Cellars Winemakers Dinner - limited seating, call for reservations 541-318-8435. Also, The Jackalope Grill will be closed Tuesday September 23 for a private party. For more, go to jackalopegrill.com. This month, Thump Coffee showcases art created by children living at the Vima Lupwa Home in Luanshya, Zambia. Vima Lupwa, the locally-based nonprofit founded by Bend native and Central Oregon Community College student Malerie Pratt, provides a loving foster home for a handful of the most needy among Zambia’s more than one million orphans. Featured artists include Melody Banda, age 12; Mwape P. Malubeni, age 11 and Malama Membe, age 16, who runs the home’s bicycle repair business. The framed art will be available for purchase, and all proceeds support Vima Lupwa Homes and its mission. Violet Membe, a Zambian social worker and mother of two, co-founded the Vima Lupwa Home with Pratt. She and her husband raise the foster children as part of their family, providing a truly Zambian upbringing where they are raised with their own culture, values and religion. For more about the Vima Lupwa Homes project, as well as photos and biographies of the children, go to www.lupwahomes.org. Join us every Friday for a celebration of the classic Italian espresso drink, the Traditional Cappuccino. During TradCap Happy Hour - or Cappy Hour, if you will - enjoy half-priced traditional espresso drinks, dopios, macchiatos, and traditional cappuccinos. Many people have never ventured to try these delightful little drinks. No syrup, no chocolate, just espresso and perhaps a small embrace of milk steamed to sweet, velvety perfection! Come join this low-key exploration of the ins and outs of tasting coffee like the pros. Cuppings are usually the third Sunday of the month at 1:30 pm. Thump Coffee is located in downtown Bend at 25 NW Minnesota Ave. For details, visit www.ThumpCoffee.com or call 541-388-0226. "We care and bring families together"
If you would like to donate please only drop off clean, nice, sell-able items anytime prior to the 27th. The Fall Festival booth Oct. 4 and 5 in Bend, Oregon. This involves helping to put up and take down as well as manning the booth. We will be selling lots of awesome African merchandise as well as give out information about Vima Lupwa Home in Zambia. Any volunteer time would be really appreciated. We are again selling our annual children's art holiday cards. The cards are sold in bunches of 10 (all recycled paper with soy-based ink). We would like to start selling cards late October to early November. Last year it was a great success and we need all the help we can get. This could involve selling them at local schools, downtown, at functions, to your friends and family, your choice -- any help would be great! 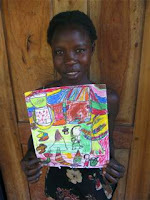 Thanks to Richard from Nativity Lutheran we will be selling a 2009 calendar featuring our Lupwa kids and their art work. We need to get the word out for these to be a success. Your ideas are welcome. If you have fundraising idea to help our home for children in Zambia we would love to hear it. No matter your age or experience these are all of our children and it takes all of us for this home to be success. We're very excited about it, and I'd really appreciate it if you can pass the word along to those who might get it. 1.Paint an Adirondack chair...they sold well last year. I'll supply the kit and finish with a clear coat. 2.Pre-sell tickets to the fundraiser. 3.If you work with kids, get them involved in donating an art project or something. If you have any desire to help in any way, please contact me. Thanks and have a great day.